Weird Sports by Michael Teitelbaum. Review: When most people think of basketball, football or hockey there is no weird in their thought. But when it comes to less traditional/private sports they get crazy and weird. 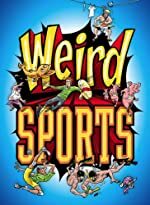 The author of Weird Sports is Michael Teitelbaum and Weird Sports is filled fill all sorts of sports. There are weird yet, cool sports. In Weird Sports readers will learn about less traditional sports. For example, in the Scottish Highlands people toss a high wooden pole similar to a telephone pole with the intention not to throw it the furthest but, to yield a solid landing. Another game that is played in Thailand and India involves elephants playing soccer with people riding on them. It's called Elephant Soccer. A few of the other weird sports include Turkey Bowling, Extreme Ironing, Toilet Racing, Chess Boxing and Mullet Tossing. These are all really weird sports. The book has many different and unique sports and maybe some of them can influence the readers to try one of theses or even create a weird sport of their own! I really enjoyed learning the new sports. Weird Sports has numerous types of sports. Some of the sports give insight into the people and cultures in various region of the world. Also, Weird Sports shows how not only lacrosse, basketball, football, horse racing and soccer are sports but instead the world is filled weird and interesting sports. In fact, if it is a boring day a person could play one of the sports alone because most of them can be done with any number of players. We would like to thank Raab Associates for providing a copy of Weird Sports for this review. Have you read Weird Sports? How would you rate it?